Drawing on current scholarship, Education and Society takes students on a journey through the many roles that education plays in contemporary societies. 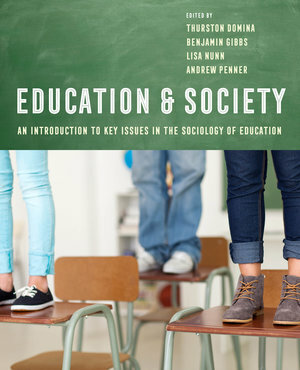 Addressing students’ experience of education before expanding to larger sociological conversations, Education and Society helps readers understand and engage with the topics covered in the book, including peer groups, gender and identity, social class, the racialization of achievement, the treatment of immigrant children, special education, school choice, accountability, discipline, global perspectives, and schooling as a social institution. The book prompts students to evaluate how schools organize our society and how society organizes our schools. Moving from students to schooling to social forces, Education and Society provides a lively and engaging introduction to theory and research and will serve as a cornerstone for courses such as sociology of education, foundations of education, critical issues in education, and school and society. Benjamin G. Gibbs is Associate Professor of Sociology at Brigham Young University. Lisa Nunn is Associate Professor of Sociology at the University of San Diego. Nunn is the author of 33 Simple Strategies for Faculty and Defining Student Success as well as past president of the Sociology of Education Association. Andrew Penner is Professor of Sociology at the University of California, Irvine.